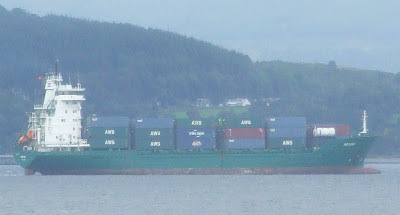 Formerly a regular caller at Greenock every Tuesday, when named ARKLOW CASTLE and owned by the Irish company ARKLOW SHIPPING, this little container ship has recently returned to the Clyde. Now named MERIWA, she was sold by Arklow in January 2005 to German owners, Tom Worden. After an absence of a couple of years, MERIWA has taken up service on a charter to MacAndrews on their Liverpool - Greenock - Bilbao service. Full information about this 11-year old ship can be found here.